Published on June 11, 2011 in personal. Closed Tags: CRV, George Zachary, Silicon Valley, VC. Its been two years since I moved to Silicon Valley to work at Vast.com. It’s an amazing team, and being mentored by former CEO Kevin Laws and the current CEO John Price will leave an impact on me for the rest of my career. However, I’ve decided to leave Vast and have accepted an offer in what is literally the heart of Silicon Valley on Sand Hill road, at Charles River Ventures (CRV). My new boss is George Zachary (ranked as #48 by Forbes, and rising). Despite not announcing it (thanks Marshall), I’ve received many a private congratulations and a few publicly. I can’t say much about my role publicly other than I’m the new best friend of the seed portfolio at CRV, where their success determines my success. So in that regard, I’m looking forward to making them as successful as can be! Published on October 8, 2010 in Business and personal. Closed Tags: capitalism, information, people, Sydney Morning Herald. David Wilson, a journalist for Fairfax, approached me the other month to give him my thoughts of Silicon Valley. 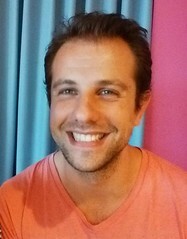 The resulting interview appeared on Fairfax’s online mastheads (which include The Age, the Sydney Morning Herald, and the Brisbane Times). The article had more focus on me than I expected, but Wilson still captures some important lessons I’ve learned since moving here. So it’s not about the big plan, it’s about a day by day by day by day and seeing where things go and just kind of making decisions as we go. And the main reason why I think this is important is because people often make decisions with the wrong information. So they make decisions far into the future, based on information they have today. You’re better off making decisions today based on information you have today because that’s when you make your best decisions. You make your best decisions when you have the best information. That’s always right now. Another lesson I’m learning but which I didn’t mention, is that capitalism — effective capitalism — is brutal. It’s something I’ve observed with successful business people in Australia and America and I’m still trying to collect my thoughts about it. For example, employees and their termination — I’ve had several people explain to me the difficulty they’ve experienced doing it, which is for the better of the business. To put this in context, loyalty and personality should not be confused as performance (which really, is the point of the employment). And if you’re not performing (or the broader function you are a part of), there’s the door. Brutal, I know — but what’s more brutal is a business collapsing and everyone losing their jobs. Effective capitalism isn’t about protecting an individuals ‘entitlement’ to a job; it’s about evolving the entitlement of an enterprise so that it can continue to sustain itself. Published on June 6, 2010 in personal. Closed Tags: people, startup, techcrunch, the startup bus. As for the bus, I’m really sorry for the lack of posting – I hope to correct that. In better news, I’ve got some exciting plans for next year that will take it to the next level (feedback so far: “you’re crazy” which is the first idea – by the fifth one people are laughing at how crazy I am). Looking forward to sharing that once I start moving ahead on that, which I will announce at the end of my series on the startup bus (as I promised). Published on July 22, 2009 in video. Closed Tags: advice, Bootup Camp, eliasbizannes, human nature, people. Last Tuesday, I spoke at Bootup Camp, an initiative run by my good friends Bart Jellema and Kim Chen at Tjoos. Four teams worked for 14 days from 9am to 9pm to conceive, build and launch a business. Speakers came in every day to give advice, and I give my insights into communications, human nature and generating an emotional connection with an audience. I’m cringing, but people that didn’t attend did ask me to share the videos when I got word. So here it is – enjoy! Published on June 25, 2009 in Podcasts. Closed Tags: change, Internet, Iran, people, podcast. Below is a podcast I recorded two days ago on Tuesday 23 June 2009 around 1200 UTC. For your benefit, I’ve attempted to transcribe the conversation as best as possible. [1:08] So let‚Äôs now tune into my friend, who‚Äôs identity can‚Äôt be revealed, sitting in Iran right now. [1:17] Are there protests happening outside of Tehran? Is there widespread discontent with the population? Yeah yeah. I hear from a friend of mine in Esfahan that there were some rallies¬†at Esfahan university and there were some bombings in there. And they ‚Äì students I don‚Äôt know if students or some people else ‚Äì they fired the amphitheatre of Esfahan university of technology. There were broken windows and this situation there was so much much worse than here.¬† And the university of Esfahan is completely off these days. But, in my university, the exams are holding, but in the University of Tehran and the University of Esfahan, the exams are completely off. [4:40] Yeah right. The situation is that everyone thinks the election was rigged. What makes people think it is. Has there been evidence or people just think it? Why do people think it has been rigged? Well, y’know the majority of people that I confirmed, they don‚Äôt actually think that actually Mr Mousavihas actually won the election. They think that Mr Ahmadinejad has won, but not with the huge margin that they say. Y‚Äôknow, they want to rig the election because Mr Khatami won 21 million votes and they wanted to break his record by Mr Hashemi. They wanted to show people that Mr Ahmadinejad is more popular than him.¬† Y‚Äôknow, students and people ‚Äì they were saying that the people around them ‚Äì they were not seeing the villages ‚Äì y‚Äôknow inside the cities. They were thinking it was just themselves that were voting.¬† I think that Mr Ahmadinejad has won, but not with this huge margin. Maybe the election might be, is going to be next level, and Mr Ahmadinejad I don‚Äôt think he won the 50% plus one votes. Alright? [6:24] Yeah ok. So from what I understand also is that people don‚Äôt want to completely overthrow the government and have another revolution.¬† They just want a better government.¬† Is that true? [8:22]‚Ä¶And what do people think of Musavi and his backer Rafsanjani.¬† What are the perceptions of the public to those people? Mr Mousavi is not a hero.¬† Of course, then he was not a hero, but now he‚Äôs a hero.¬† No ‚Äì he is a person which was so popular to Mr Khomeini and he was so close to him and one of the people who had a very huge role in the victory of the Islamic Republic. He‚Äôs someone inside the system, and he‚Äôs not come outside of the system to change it ‚Äì he‚Äôs one of them. Actually, before these protests people said he was one of them ‚Äì but when he showed so much courage and so much bravery in behaving and consulting in these situations in Tehran ‚Äì he didn‚Äôt push back and he didn‚Äôt take down the protesters ‚Äì and encouraged them to more and more protest.¬† They now think he is a very brave man; he‚Äôs not one of them ‚Äì he‚Äôs come to change the situation. About Mr Rafsanjani ‚Äì I know, the people were not backing Mr Rafsanjani in his presidential period, which was for eight years.¬† And people hated him – and in the previous election, they think that anyone but Mr Rafsanjani¬†that was competing against Mr Ahmadinejad, he would have won the election. But because of Rafsanjani, Mr Ahmadinejad won, and whomever was in front of Ahmadinejad¬†was losing ‚Äì er, was winning the election but Mr Rafsanjani. But after that, people saw lots and lots of criticism from Mr Rafsanjani of Mr Ahmadinejad, they think he changed his behaviour, and when he supported Mr Mousavi ‚Äì I‚Äôm not saying¬†that people are now a fan or supporter of Mr Rafsanjani ‚Äì but people think that he‚Äôs changed. But, they hate him anyway right now, but not as much as before. His family ‚Äì people believe, there‚Äôs so much evidence about his families financial corruption in the country ‚Äì people are always talking about his daughter, his boys – and their corruption. [12:10] So, what‚Äôs happening right now? What are you seeing around you? Are there people all over the streets, police that are restricting movements? Have they cut down the Internet? What are you seeing right now? Around me, which are students of the university,¬† I can see so much disappointment in their faces about their future. Lots of my friends and lots of students here are determined to learn English, and send applications to foreign universities overseas, and apply to different universities to get out of this country. They say they cannot endure this situation anymore. Me neither can endure this situation here, and I am determined to leave this country. And some people that are stuck to the system, they remain here ‚Äì people that are not satisfied with the situation will leave the country. The intellectual people are among those who are not satisfied with the situation, and if these people leave the country, there will not be any more intellectual engineers, there are not more talented people in here, and I think it‚Äôs going to be a huge mess. [13:55] What would people want to see though, to prevent this sort of drain of people leaving the country. What is it that people want to see to fix up Iran? [15:03] So if Ahmadinejad is taken out of government, would people be a lot happier? You mean to crackdown this government? Yeah ‚Äì do they just want different people elected? Is that the only change they want? Um ‚Äì I think the majority of people want Mr Mousavi to become president. They do hope for a bright future and for positive changes in the country with Mr Mousavi ‚Äì I think they just want Mr Ahmadinejad to resign and to be taken out of Iran politics. [16:06] Something I want to get clarified and that would be interesting¬† – things like Facebook, Twitter and all that ‚Äì have they been blocked by the government? Yeah yeah, these whole websites are filtered. We can‚Äôt Facebook ‚Äì YouTube ‚Äì even I cannot access my Yahoo Messenger and mailbox Yahoo.com ‚Äì and the situation is very tough. Even some websites inside the country which had permission from the Islamic Republic like cloob.com which is a website inside the country ‚Äì they just don‚Äôt want the information to spread around the world. And with the pictures, they don‚Äôt want the world to see the violence. And some extremist websites and TV like we the voice of America, which are so extremist about pulling down this government.¬†They are scared of truth! What the BBC says, y‚Äôknow the BBC with no personal focus, just saying the truth ‚Äì they re sending so much noises on satellite. Given the BBC has gone down, its broadcast on Hotbird start broadcasting on Telstar and Eutelsat? [18:05] How are people organizing the protests? Is it through SMS and telephone calls then, if all these important websites are blocked, to organise? The SMS was also cut down for about a week and a half. The mobile phones are ok, but not in Tehran. In Tehran, the whole telecommunications system was cut down and people were just using card phones, home phones ‚Äì and they were spreading the news just on the internet via Yahoo messenger, especially some blogs ‚Äì and people are using anti-censors and proxies to access the website and get the information about the place and the dates of the protests‚Ä¶but the SMS service was not on for a week and a half. [19:26] What‚Äôs going to happen now?¬† What‚Äôs going to happen in the next few weeks? Do you think it‚Äôs going to be predictable, or do you think everything is unpredictable at the moment? Published on June 20, 2009 in personal. Closed Tags: Australia, career, eliasbizannes, Silicon Beach, Silicon Valley, Sydney. My life is about to get a big shakeup. I’ve accepted an offer at San Francisco based Vast.com, after spending nearly four valuable years at the Sydney office of PricewaterhouseCoopers. New job, new industry, new city, new country. In the last few years, I’ve come out of nowhere (meaning no idea how!) to become a person driving a global industry movement (the DataPortability Project) and a recognised champion for my nation’s Internet industry (Silicon Beach). Ironically, I don’t have a computer software background (I’m a chartered accountant), and I don’t work directly in tech (I’ve worked in financial services) So this transition is a realignment in my life, that I hope will bring me closer to doing what I’ve recognised is my true passion: building Internet companies that add value to our world. Reporting to the CEO, I’ll be managing the overall finance and accounting functions of the company. However with time and as the company grows, I’ll be taking on additional responsibilities that can extend my current skill-base and experience. I’m thankful that the CEO Kevin Laws (one of the smartest guys in any room – seriously! ), the chairman Naval Ravikant (one of the most successful Valley entrepreneurs around – 15 companies and counting! ), and Director of Product Steve Greenberg (wisest guy I’ve ever met – both in insight and wit) believe in me and want to help me reach my potential…whatever that may be. Vast.com has an exciting business model with a veteran executive team – I don’t know where my future is headed but I know it’s in good hands. So are you giving up on Australia? No way! In fact, I think my presence in Silicon Valley is going to allow me to extend the Silicon Beach effort. I will have a permanent couch reserved for all of Australia’s tech entrepreneurs (well if I can – housing and room-mate pending!) and I’ll be developing my expertise from the world’s best to share back with my compatriots. I do hope one day to return to Australia and I have plenty of reason to do so – my family is in Sydney as are my half-dozen best friends who quite literally are the best mates a guy could have. I’ll still be doing the Silicon Beach podcast’s and whatever else I can to keep me connected to Australia – socially, professionally, spiritually – but having said that though, it may be a while before I do come back. I’ve got a hell of a lot to learn first! This is a move that I hope will position me for bigger and better things. Its been a very hard decision to give up my near perfect life in Sydney, but I’m also very excited about the opportunities possible in my new position. Living overseas is something everyone needs to do in their lifetime for their own personal growth, and working in Silicon Valley is something I had to do (or as my new boss Kevin has said repeatedly now, “you belong here”), otherwise I’d forever regret not doing it. 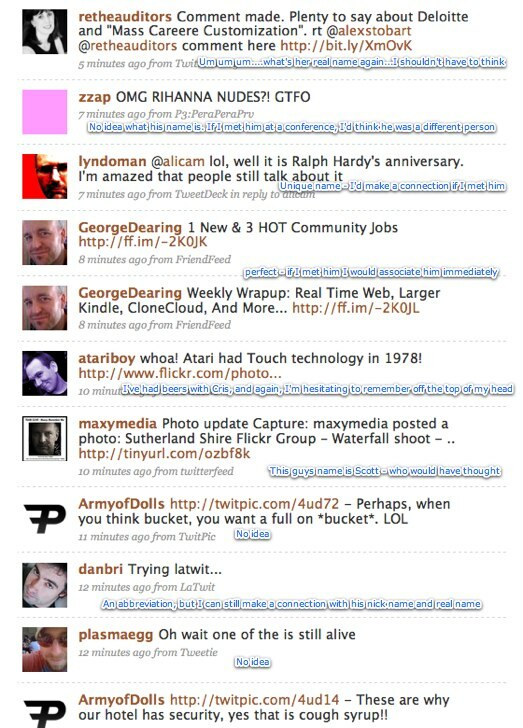 Published on May 10, 2009 in Blog. Closed Tags: blogging, brand, Chris Saad, identity, Marty Wells, Mick Liubinskas, people, Privacy, Twitter. Yesterday I switched over my blog to a new domain name: previously Liako.Biz, it now resides as a sub-directory off a domain with my real name (http://eliasbizannes.com/blog). 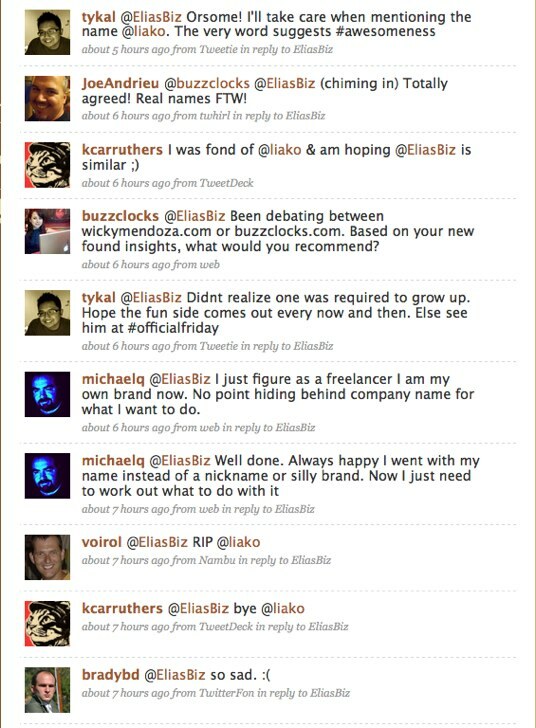 Further more, I renamed myself on the primary micro-blogging tool I use (Twitter) from @liako to @eliasbiz. For most, you wouldn’t see why that matters so much – but for those knee deep in social media, you’ll understand how much of a big deal it can be. In the course of my decision, I realised a few things, so I thought I’d share it here. I created Liako.Biz in 2005 to document my travels. Although I was partly doing it to explore blogging as a concept, I never realised that my future would be in technology. A year after my trip, I relaunched my blog with a focus on issues I came across in the information and technology sector. The name “Liako” – which is a nickname for “Elias” in Greece and used by my brother and an ex-girlfriend – extended across the web as my online identity. With all these sites I would sign up to, I didn’t think much of it. Turns out those sites now matter. Due to my work in the DataPortability Project, the concept of online identity has always been on my mind, so perhaps I am a bit more involved in such thinking than most people and hence why I think it’s a bigger deal. More recently however, I noticed Chris Messina have to go through this thought process as he renamed his Twitter profile. Rebranding yourself is a big deal, that I can understand why Messina hasn’t got around to rebranding his blog. It sounds ridiculous doesn’t it – changing your name on a service is a big deal. The question I suppose is why is it so? All these technology tools are enabling us to stay connected with other people. Twitter as a case in point: I was pulled into that two years ago after Marty Wells and Mick Liubinskas told me it was critical if you are involved in tech. We are seeing now beyond the tech community but in our everyday life, our reputations grow and develop based on our online activities. As relationships form and develop through these online tools, an emotional connection is attached with the persona of the person they interact with. As soon as I announced a name change on Twitter, I immediately got a reaction from friends – it wasn’t just me, they literally felt like something had changed – validating the emotional connection people build with a brand. Anyone that has a blog understands how hard it is to build up its credibility. You require hundreds of people to link to you, for your blog to even reach a credible level. So to create a new domain name, you effectively are throwing out all that brand value and starting again. It’s like throwing money away for no reason. Chris Saad and Ben Metcalfe convinced me I needed to drop my liako brand and go with my real name. It’s just common sense to do that – as your profile in the industry grows, people need to know you by your real brand (your actual name), not some alias which in the flood of other aliases makes it even harder for people to remember and distinguish you. Twitter as a case in point (again), to get value from the service, you should follow people you don’t already know -which is how I know the people pictured below. These people created their own brand which is fine, but it’s lost opportunity – as far as I am concerned, they are two separate people and unless I know them well I may not join the dots. Our online identities are no longer a play thing: they’re now an intrinsic dimension to our overall identity. Identity is a crucial thing that we need to protect: it can affect our emotional health due to the standing we have in a community – and it can also affect our financial security due to people compromising it. It permeates our life in more ways than one. Working in the Internet industry, I’m more acutely aware of the importance of my online identity as it directly relates to my career. But our lives are slowly being transformed by the Internet, and even if you don’t have a career touching technology, your online identity is increasingly going to become an important part of you. From a personal branding point of view, it’s obvious why you consolidate your names. You don’t need to necessarily pick your real name, but you need to stick with one name that makes you unique. If you don’t have a unique name, it makes more sense to pick a nickname. However, our actual names are the only brands that matter. We are not companies selling products; we are people selling ourselves. But something that is worth considering are the privacy implications of using your real name on everything. A Google search for me will now bring up my real time thoughts on Twitter, which sometimes are about other people – not something I want happening in real time. Using multiple names actually can be a good thing, as I don’t want some girl I meet in a nightclub to be able to instantly track me down online (which has already happened – jut because I meet someone doesn’t mean I want to be permanently connected with them!). Separately, I’ve recently had some people harass me (non-stop communicating via multiple channels that I wasn’t responding to) and stalk me (turning up somewhere uninvited), and it’s frustrating to not be able to control the communication from them as you are everywhere and cannot really hide from them. Although I’ve developed some goodwill on the Liako brand over the years, I am aware my real break into the industry hasn’t happened yet. So better to start fresh now – and do it right. My future is in the industry, and as painful as it has been to change over – getting it right now will pay off later. I’ve grown accustomed to Liako (my real world friends call me that now! ), but using a nickname is exactly that. It disappoints the creative inside of me, but when we are talking about our identity – unless you’re an entertainer seeking attention – it’s worth being boring about that. Published on January 2, 2009 in Blog. Closed Tags: Athens, Blog, Iran, Russia, Travel. You can also read 2008 and 2007 summaries. Like a good host should, I welcomed you to my new blog which was to document my travel experience. Writing in April 2005, I then proceeded to say how I landed in America (Ohio) and then Boston (with a cheeky review of Harvard ). I also managed to visit New York, before I made my way to Europe to Gallipoli for the 90th ANZAC Dawn services and one of my favourite cities Istanbul. Similarly, May 2005 was a fairly lame month of blogging as I was still getting into the groove. I spent a month literally sleeping, and trying to create some sort of travel plans. I stayed with my cousins in Athens and managed a side-trip to Mykonos. I finally got into the groove in June of being a blogger that engaged an audience. It started with my trip to Albania, which then progressed to Macedonia, Serbia, Bosnia and Herzegovina, Croatia and Slovenia. My Balkan bash had to end there as the sisters in London called, so off I went to see them and the new baby. However I then had to go back to Greece, and what better way to do it than over land. Unfortunately, it meant I had go through the Nagging wife countries but it’s okay because I partied all the way. I partied a little too hard and developed pneumonia, which was a bummer for my trip, but by late September I had enough and headed to Athens (from Athens via Moscow) starting with Bulgaria, then onto the long road to Iran via Turkey until I finally got to…Iran. Iran was cool to see but hot at the same time, so I opted for some cold in Russia. Seeing as Estonia, Latvia and Lithuania were just down the road from Russia, I also visited those countries. Oh and heck, since I was there, I went to Poland, Prague and Budapest until time ran out and my nine months away ended with a finale. Published on January 1, 2009 in Blog. Closed Tags: advertising, apml, Blog, people, social networking. You can also read 2008 and 2005 summaries. Don‚Äôt get the Semantic Web? You will after this: No really, you will or your money back. Facebook is doing what Google did: enabling: I make the case that Facebook is having the same impact on the industry as Google. They are building an ecosytem that allows other companies to exist. John Hagel – What do you think is the single most important question after everything is connected? : My notes after hearing a brilliant presentation by a very, very smart man. A casual chat with a media industry insider: A family friend is an executive at a major newspaper, so I picked his brain! Facebook poll: how many friends do you have? : Facebook was promoting their new poll feature, and by chance it was one about the demographics of Facebook. Interesting statistics. Australia as Silicon Beach: Here I proclaim that I will now call the Australian industry "Silicon Beach"
Grand thinking requires space, flexibility and time: What the title says, backed by research. New measurement systems need a purpose: A metric to measure attention needs a step before that. We need to determine what value we seek to obtain when measuring. How to become the next Google: You will become the next Google by thinking ahead. Don’t copy Google’s market: instead look at how they created such a market. Patents: more harm than good: Using publicly filed patents, I was able to uncover what a "stealth" startup was building. A look at how patents are a stupid idea. The reason for success on social networking sites: Public discussions on MySpace are motivated by increasing status. Building a (sustainable) business: Web2.0 is full of great "products" but not businesses. Published on December 31, 2008 in Blog. Closed Tags: Blog, data, New York Times, web. I launched this blog in March 2005 as a travel blog. People would flood me with e-mails about my travels, and it made me realise how powerful blogging can be (not to mention fun). I re-started this blog in March 2007 as a "career" blog (whatever that’s supposed to mean). It’s probably best now to describe it as my "passions" blog which evolves as I progress through life and think about things. What I love about blogging is that it forces me to think; forces me to research and learn; forces me to challenge my ideas by interacting with other people. All the good stuff in life – I hope to give a bit more attention next year. I also thought it would be good if I summarised what I wrote about this year. Heck – let’s go right back to 2005. This will be the first in a series of three blog posts progressively released – starting with 2008 today, then 2007 tomorrow and finally 2005 two days later. For those that may post comments, bear with me as I have literally 24 hours of New Year’s concerts to attend to (get home at 6am from Shore Thing, ready for Field day at 11am). It may take me some time to recover and get back on a computer! I’ve given you a brief summary to guide you on whether you should make the great leap and click. I was going to rank my articles with a simple "good, poor, average" and I ended up getting stuck reading some and think 90% are more or less the same style (so I am either consistently crap or consistently good). Thank you 2008, you finally gave New Media a name: I indicate how 2008 was the tipping point for the Information Age’s Social Media to finally trump the Industrial Age’s Mass Media. I researched the history of the concept of Social Media, explained what "media" really is, and how the term "Social Media" is the perfect term to describe what we’ve been calling these evolving communication trends. The makings of a media mogul: Michael Arrington of TechCrunch: A detailed analysis of how a nobody became one of the most influential men in the world as a New Media pioneer. Mr Arrington even thanked me! The future of journalism and media: A look at the Watergate scandal as well as my own personal experience with a university publication, to understand the core dynamic of the media. I argue that what made the mass media tick in the past was a marketplace, and it’s one that can be applied to digital media going forward. So open it‚Äôs closed: I make an argument that the term "Open" is being abused and has lost its meaning. We need better guidelines on what constitutes an "Open Standard" before it becomes too late. Social media and that whole ‚Äúfriend‚Äù thing: A post about how there is pressure to subscribe to peoples content on various services, even when you don’t want to receive their content. The result is an unusable service. I reflect on how Google Readers friends option is a simple but more effective way of social media, as it removes this pressure. Liako is everywhere‚Ä¶but not here: Some links to content I have been creating elsewhere, as this blog had been neglected! You don‚Äôt nor need to own your data: We live in an economy now where you don’t need "ownership" to live your life. This will certainly make you think! The DataPortability governance framework: a template: An update, history and recognition post of the many months of hard work for the team that created the governance and workflow model for the DataPortability Project. It was a challenge because existing models aren’t designed for an online virtual world that we operate as. It‚Äôs the experience that matters: How the digital revolution is making us realise content is about an experience. Content is not something you control. Advertising on the Internet needs innovation: Explaining the problems online and attempts to monetise content. I survey the landscape to explain we need a new approach. The value chain for information: My proposal for an information value chain. Someone even made a video to explain the concepts, if you don’t feel like reading! Emerging trends? Nope – its been a long time coming: I dug up something I wrote several years ago on emerging trends to prove a lot of what we talk about today have been a long time coming. It‚Äôs all still alpha in my eyes: Highlighting that the Web 2.0 era is dead, but really that’s a distraction for a bigger thing at play. I write about what I think are the trends at play. Information overload: we need a supply side solution: I explain how the business models of current are forcing content creators to create more and more content, despite content consumers not being able to keep up. Here‚Äôs a secret: the semantic web is the boring bit: Giving some perspective on the semantic web and companies sprouting now to cater for it. Can you answer my question? : I look at "data", "portability" and "ownership"
Don‚Äôt cry for me, Argentina! : I spent a month in South America and wrote a post about it.